Rachel Ashwell Westminster Bedding - Swatches may be available. 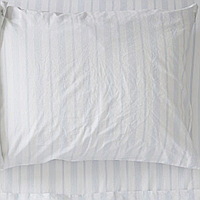 100% Cotton Poplin in a classic yarn-dyed stripe design inspired by vintage ticking fabrics. Machine washable. 100% Cotton Poplin in a classic yarn-dyed stripe design. The Westminster collection features a lovely classic yarn dyed stripe design inspired by vintage ticking fabrics.